Ground meat reminds me of arguments. When I was a kid, the adult arguments I remember were often followed by bolognaise. I'm pretty sure my child brain twisted the memories a bit. There were likely arguments when mince wasn't served, and we probably ate a fair bit of it without fights. But one of my strongest memories is of awkward dinners where conversation was a forced kind of "don't let on to the kids" friendly. To this day I don't cook with mince. Funny how random moments as a kid shape your tastes as an adult. 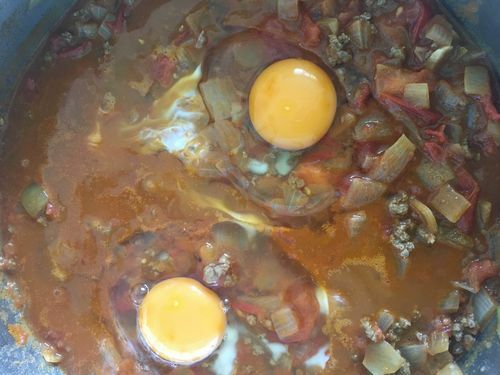 So when the first recipe I came across when researching Albania was a simple, yet common dish of eggs baked in a mince-base, I barely even looked at it. Albania has a host of neighbours to draw some pretty incredible culinary influences from, with Italy, Greece, Montegro, Kosovo and Macedonia covering most of the border space,and the Adriatic sea on the east. It's also had a pretty long and nasty invasion history. Italy, Greece, Ottoman Turks and Serbia have all had a crack at different times throughout the country's history. With such a rough past, and a lot of harsh, rocky mountain terrain, Albania is still trying to recover from major issues with iliteracy and poverty. Despite that, life expentency is generally pretty good. Maybe it's in the diet. Heavily influenced by its history, Albania's cuisine features a lot of fresh produce and fruit, olive oil and very little cow's milk products (while cheese and yoghurt is huge, it's generally made from goat milk). Baklava, eggplant, rice pudding and spinach pies have been adopted as pretty staple Albanian dishes. Corn is the most widely available crop, though rice is growing in popularily. In the mountainous areas where poverty is a major issue, the diet consists largely of corn, yoghurt and cheese. In other areas, lamb is the most popular meat. Stewed, baked in a sauce of egg and yoghurt or used as a stuffing for eggplant or capsicum. Liver is a delicacy, seafood from coatal regions are common. Lamb meat may be good in Albania but, apparently, the animal's head is truly king. After seeing my first image of a line of roasted lambs' heads on display, I'm kinda intrigued. In a "that looks pretty gross but I'm also really curious" kind of way. After perusing even more recipes and photos, I'm definitely a little obsessed with the idea. Ever tried to find a lamb's head at short notice down at the local, though? Turns out it's not that easy. And, honestly, some of those images do look pretty off-putting. I'm determined to cook an animal's head at some stage along this journey. But today is not the day. I'm not that adventurous just yet. And for whatever reason, I kept returning to the first recipe I found. 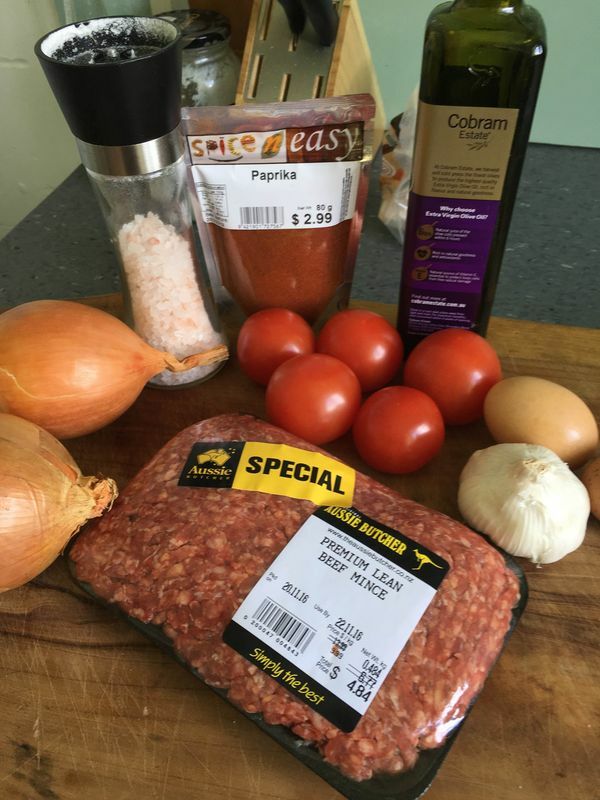 So mince it is. Kime me vez is pretty simple. One pan, cheap ingredients easily sourced and spiced only with paprika and salt and pepper. It's also, from what I've read, quintissentially Albanian. The basic concept of chakchouka, but with the addition of ground meat. Interestingly, although lamb is the most common meat in Albania, every recipe I saw for kime me vez suggested beef. There's a lot of onion-chopping involved. About 1.5 onions per person. I also realised, when hit with the sweet smell of brown onions cooking, that I can't remember the last time I cooked with them. My Dad used them all the time when he made curries, I can't remember smelling it since he was alive - more than 13 years ago. Amazing how quickly certain food smells can transport you to something you haven't thought of in years.There's something about that smell, right? Similar to the smell of bacon. Smells like childhood. Or maybe that's just me. Garlic, paprika, salt, pepper and ground beef goes in to be browned and finally water and chopped tomatoes to make the sauce. And that's pretty much the bulk of it. Except the eggs. The most important part of this particular dish. If you ask me, they're pretty much the most important part of any dish. There's no beating a perfectly cooked egg. Undercook or overcook by the smallest of margins though, and the entire meal is ruined. The importance of egg cooking can never be underestimated. Trust me on this. I've spent a lot of time and research mastering the perfect poached egg (3:20 on a low heat, if you're curious). This isn't poaching though. Chance of undercooking the white or overcooking the yolk is reasonably high. It doesn't help that the lid to my pan isn't glass. I'll be cooking blind. My anxiety may seem a little excessive. But tell me that after being served a badly cooked egg. I wound up with a mountain of food, for very little money. Being used to seasoning everything I cook with plenty of spices and chilli, I was pretty surprised to find that a dish with very little had a fair bit of flavour. Plus, egg and paprika? How can you go wrong? The mince? Actually pretty good. Surprisingly. Generally mime me vez is served with bread, which, if you're a bread fan, would have gone a good way in soaking up the juices. 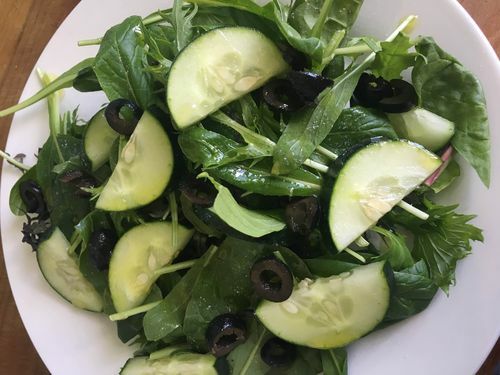 I whipped up a quick simple salad on the side - another Albanian staple. Despite intiially skipping this dish a few times before finally settling on it, I'm pretty pleased I did. 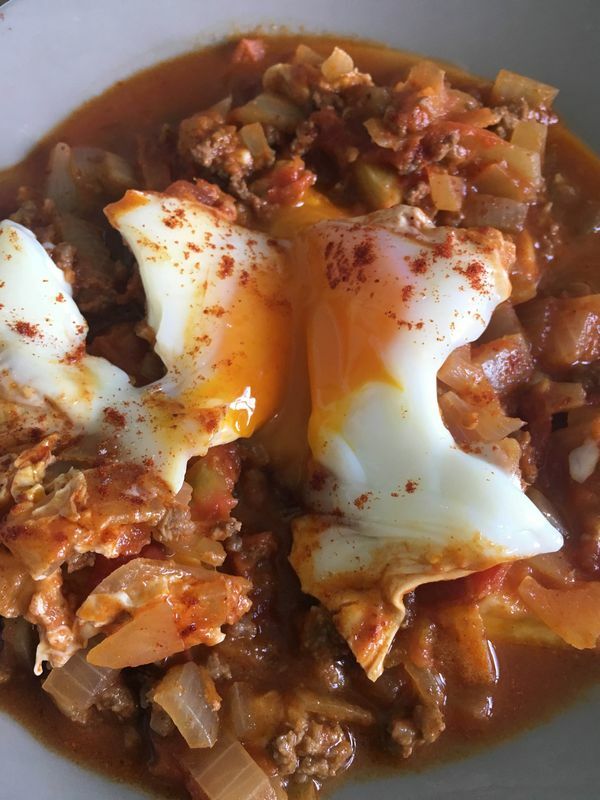 Simple comfort food with warming flavours of egg and paprika. Easily a lunch I'd tackle again. Oh, and the egg? 10 minutes with the heat reduced. Worked out pretty much bang on. In World of Food, Amberleigh Jack is cooking a dish from every country in the world. One at a time, in alphabetical order. This is brilliant opening sentence, and fantastic first para. Love it! (the food- not so much. I am vegetarian :-) but enjoyed the article anyway. When I was a kid, the adult arguments I remember were often followed by bolognaise. I’m pretty sure my child brain twisted the memories a bit. There were likely arguments when mince wasn’t served, and we probably ate a fair bit of it without fights. But one of my strongest memories is of awkward dinners where conversation was a forced kind of “don’t let on to the kids” friendly. To this day I don’t cook with mince. Amazing how quickly certain food smells can transport you to something you haven't thought of in years. There's something about that smell, right? ... Smells like childhood. Love that about food. Thank you. I'm reading these out of sequence, but if it's chakchouka/shakshuka, I'm a big fan of the one from Ima (Fort St., downtown). Every time I go, I tell myself I should try something else, but most of the time I end up ordering the shakshuka. Off to Albania this week. Your comments on frying onion was interesting, because for me it is almost the opposite. 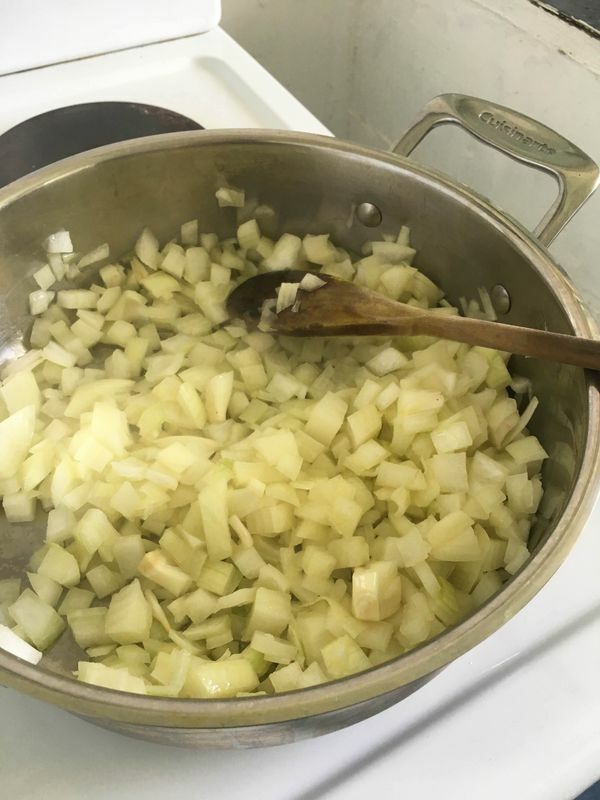 Many of my standard meals start with frying an onion, so the smell of frying onion is pretty much the smell of cooking dinner. It could be a habit that I've picked up from my mother, as she says that when we were little, and she suddenly noticed that my dad was about to get home, she'd quickly throw an onion in the pan so that when he walked in the door he would smell dinner cooking, which would give her time to get the rest of the meal sorted. 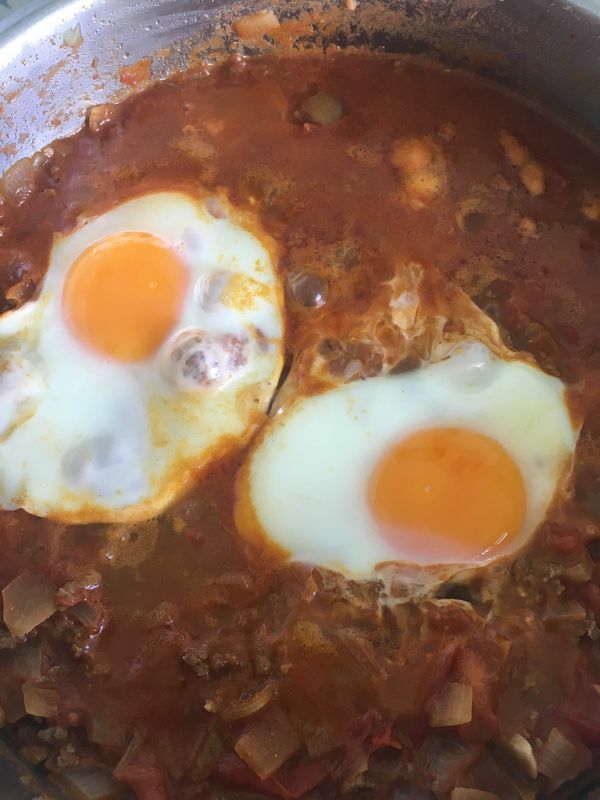 You didn't state quantities, so for the four of us (2 teenagers, so effectively cooking for 6), I used 4 large brown onions, 4 cloves garlic, 4 level teaspoon paprika, 750gm beef, and six eggs. Instead of fresh tomatoes, I used a can of Watties Italian-style tomatoes (since Italy is closer to Albania than Morocco). With hindsight, it may have been better with 2 cans. You suggested serving with bread, so I served it on toast (Ploughman's Soy & Linseed to be precise), with a green salad on the side. 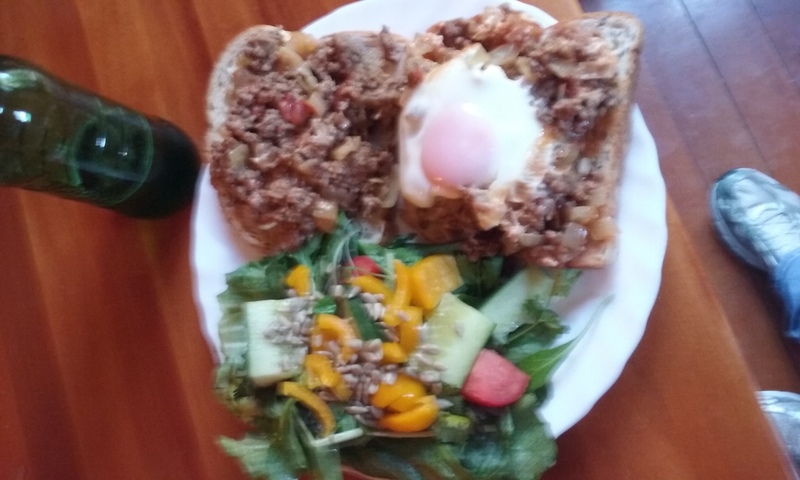 It was a great variation of mince on toast, and the 10 minutes for the poached eggs was spot on (I checked after 8 minutes, and they weren't quite done). Thumbs up from the family, with three 7s and an 8, with the main criticism being it was a bit plain. Maybe could've done with more paprika and pepper to spice it up a little more. And this time I remembered to take a photo.